The Week in HD - Monday 20th February | What Hi-Fi? Welcome back to another week of HD and 3D films, TV shows, sports and Blu-ray releases. While last week was Grammys and Baftas, this week concludes the awards season with the Brit Awards and the Oscars. We can all probably predict the winners for most of the big awards (Adele, Artist, maybe next year will have a B theme? ), but it's still fun seeing all the glitz and glamour from both carpets. In the future, the boxing rings are no longer the domain for muscular and light-footed mortals. 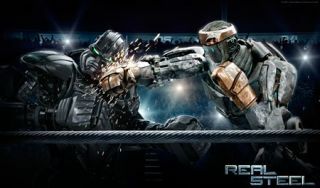 Robots have taken over Sly Stallone's favourite sport. Why? Why not. Hugh Jackman (Wolverine) and Evangeline Lilly (Kate from Lost) star in this silly but fun film. Tom Hardy and Joel Edgerton star as estranged brothers who must fight each other in a mixed martial arts event in this exhilirating and emotional film, that also features Nick Nolte as their father. Does not contain robots. With three new episodes, the Victorian comedy spoof based on Charles Dickens' novels returns with an ensemble cast of the great and good of British comedy, featuring Robert Webb, David Mitchell, Katherine Parkinson, Tim McInnery and more. Apoclyptic sci-fi thriller featuring Will Smith as the sole survivor of a virus that's left everyone else in New York a mutant/zombie/thing. I hope the dog doesn't die. A high-school student suspects that his charismatic new neighbour is a vampire and, when no one believes him, must try to destroy the bloodsucker himself. Remake, with Anton Yelchin, Colin Farrell, and David Tennant. Pilot. Acclaimed US political thriller starring Claire Danes and Damian Lewis. A soldier left for dead in Iraq is rescued after years in captivity, but a CIA agent suspects the returning hero can't be trusted. Hosted by James Corden, with live performances from Adele, Rihanna, Coldplay, Noel Gallagher, Florence and the Machine, Ed Sheeran, Bruno Mars and Blur. oh, this is looking rather fun. All bets on Adele winning everything again. Documentary following Blur on the reunion trail in the summer of 2009 after a 10-year hiatus as they rediscover music and the friendships that originally inspired the band. Ends with their epic and emotional headline set at Glastonbury 2009. If you've been bombared with massive billboards advertising Luck for the past month, well you'll now finally find out what the fuss is all about. Dustin Hoffman and Nick Nolte star in this US show that deals with the dark side of horse racing. AC/DC frontman Brian Johnson and Michael Fassbender stop by, while the presenters race mobility scooters in the countryside. Tim Burton's weird and wonderful 3D adaptation of Lewis Carroll's enduring novels sees a 19-year-old Alice returning to Wonderland where the Red Queen has begun her reign of terror, and Alice must save the day by slaying the Jabberwocky. With Burton regulars Johnny Depp and Helena Bonham-Carter, with Stephen Fry as the Cheshire Cat and Alan Rickman as the Caterpillar (brilliant castings) and Mia Wasikowska as Alice. Here's a chance to catch a repeat of Series H, with quizmaster Stephen Fry asking a hodge podge of questions starting with H.
Mark Wahlberg, Minnie Driver, Jo Brand and Christina Perri join the host. Edith Bowman and Patrick Kielty present the concert from the Royal Albert Hall, featuring Boy George, Tim Minchin, Pete Townshend, The Feeling, Chris de Burgh, Midge Ure and lots more. A Scandal in Belgravia - What can I say about Sherlock? Along with millions across the planet, I fell in love with the fabulous first series, and this episode (penned by co-creator Steven Moffat) somehow manages to be even more amazing, fantastic, remarkable - and every possible variant available in the English language - than the entire first series. Director Paul McGuigan has upped his game as well, making this episode feel even more like a feature film with stunning shots and slick transitions, while the entire cast, led by Benedict Cumberbatch and Martin Freeman, deliver the finest performances. At turns funny, intense, and heartbreaking, with lovely little nods to the original stories, this is my favourite Sherlock episode to date. Will Smith in yet another another sci-fi offering, this time an adaptation of Isaac Asimov's novel about a robot uprising in 2035. Barclays Premier League, live from Emirates Stadium. Carling Cup Final, live from Wembley Stadium. Clarkson and May pay tribute to Swedish car maker Saab. A Spectre Calls - Kirby, a 1970s ghost, comes to stay at Honolulu Heights. But is he friend or foe? A brutal, gory thriller with Gerard Butler as a man who, after seeing the man who killed his wife and child walk free, vows revenge on absolutely everyone involved in the case. The biggest night in film, the 84th Academy Awards coverage starts off with red carpet glamour. Should we expect any surprises from this year's Oscars, or will it be another predictable night of The Artist winning all the awards?